$8,239.99  $42,839.99 each List: $70,896.00, You Save: $62,656.01! The impressive Sound and Quality of the Philharmonic Timpani is worldwide the most used. The classic European style of the Adams frame, in combination with the latest computer aided machine technology, results in timpani frame construction that is unmatched in precision, quality and attention to detail. Adams Philharmonic Classic Timpani are available in the following sizes: 20"-23"-26"-29"-32" with Remo renaissance heads. Drums can be ordered either American or German playing system. New in the Adams Timpani line is the Philharmonic Classic. This lightweight instrument is equipped with a pedal mechanism in the old style ratchet, a very basic system like in former days. More and more musicians asked for a timpani with a authentic character. And because Adams is a company of continuous innovation and development they now proudly present this new model. The Philharmonic Classic featured the redesigned patented split rocker arm system. 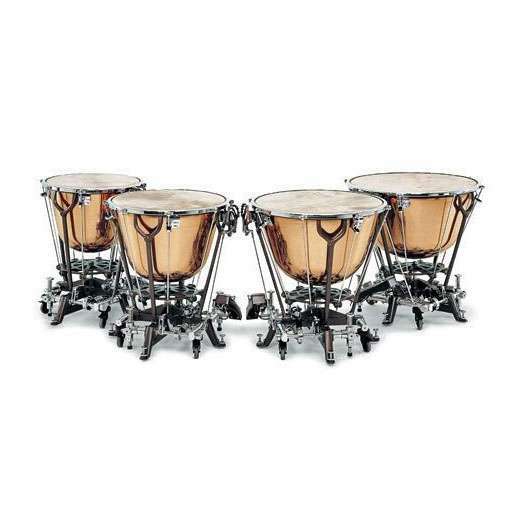 An unique system with an amazing design that decreases the pressure on the frame of the timpani. This will prevent against any flex or changes in the shape of the frame or bowl.